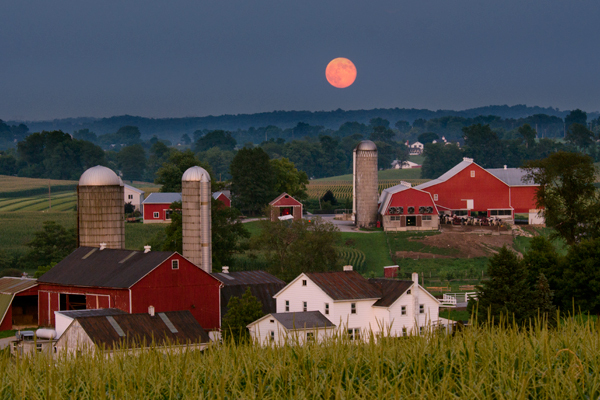 This is last nights full moon rising over a pair of farms. I went out with a friend to this spot we had tried for during last months full moon, and after using his cell phone to utilize the program called The Photographers Ephemeris,we were in disagreement over were it said the moon would hit the horizon. I used my compass and the coordinates the program said and as it ended up ,I was in the right spot and my friend was down the road a hundred yards or so in the wrong spot. It takes a little effort to look at the satellite image and decide exactly were you are and need to be,but it is a great tool. The moon was not visible right away,but became stronger as it climbed. I had to shoot from my truck roof because the corn was too high to see the farms. Here is a screen shot of the program we use. the colored lines show you all the rise/set positions.this is the portland headlight in Maine as an example. 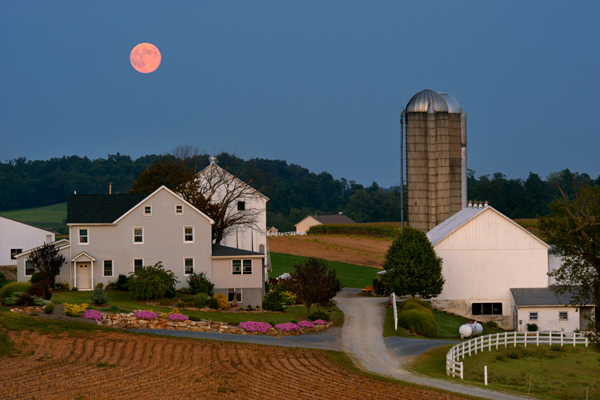 This is a shot of the so-called super moon from this past saturday. Went out with two friends to shoot this thing, and due to haze, we never saw it in the sky till it was too high and slightly smaller looking. It’s an okay shot,but nothing like it might have been at the horizon, and zoomed tighter. This moon was supposedly 14 percent bigger and 30 percent brighter as it made its closest approach to earth. The key to getting the biggest moon is to find a subject far away,so you can use your strongest telephoto to include the moon and something interesting together. Had the conditions been crystal clear, and the moon had risen between the silos,I could have zoomed much tighter and had a much larger moon. Today was full moon, and It reminded me of a shot I took last month during full moon. 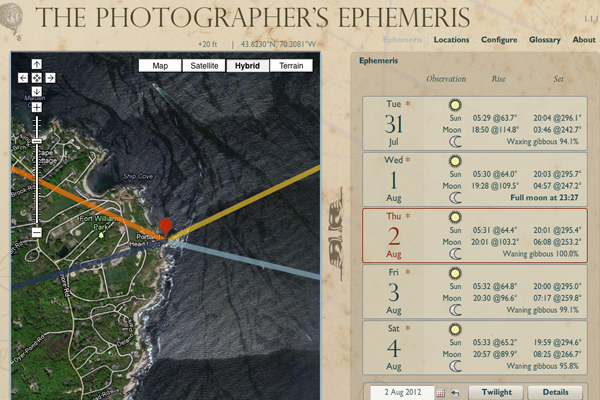 As a photographer, I make every effort to plan ahead as much as possible, and by using a free program called – The Photographers Ephemeris, which uses google earth to show you sun/moon locations, I previewed a few potential places I wanted to shoot to see if the full moon would be in the right spot. 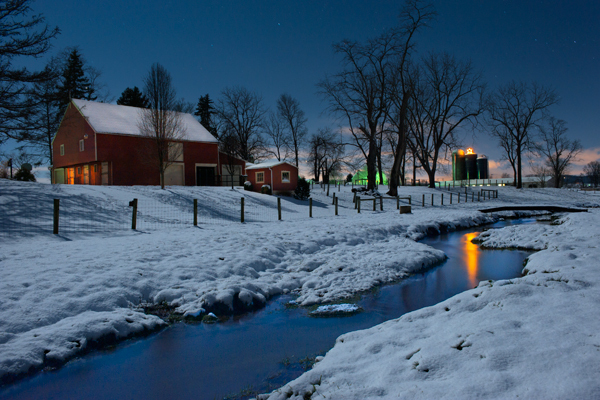 This farm, complete with a flooded field yielded the perfect opportunity. 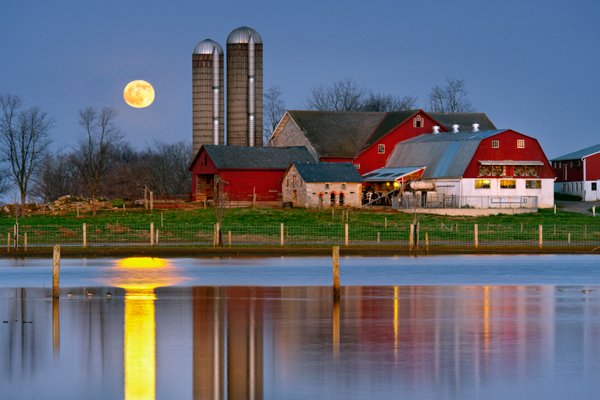 The key to capturing such an image is to shoot when moonrise happens right at sunset, so exposure can retain detail in the moon and the landscape. It’s a fleeting few minutes.The glow on the water is all real, and a slight breeze almost ruined my shot. 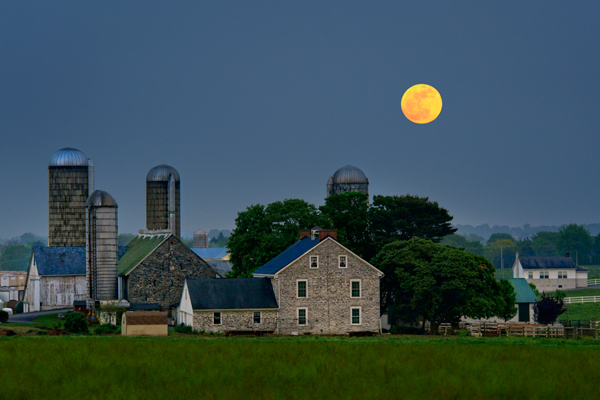 Instead of rushing around back roads, I arrived, set up my tripod, aimed exactly where the program said the moon would rise and simply waited for it to appear.The accompanying buggy shot is taken from the same location a few days later. The water just sits here from the summer floods and has covered the road numerous times. 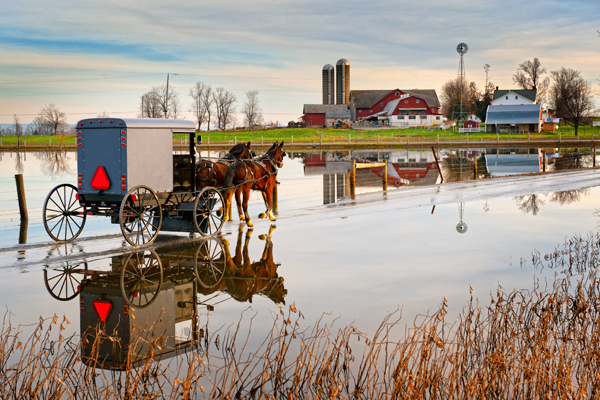 I made over two dozen trips to this spot, which is approx 15 miles away to capture this unique double horse-drawn buggy image. A link to the Sun/Moon tool is in my blogroll. Try it on your home address to see its accuracy.